Home › Bible Prophecy › Is Comet ISON In Trouble? Comet ISON Spewing Huge Quantities Of Gas and Dust. Is Comet ISON In Trouble? Comet ISON Spewing Huge Quantities Of Gas and Dust. 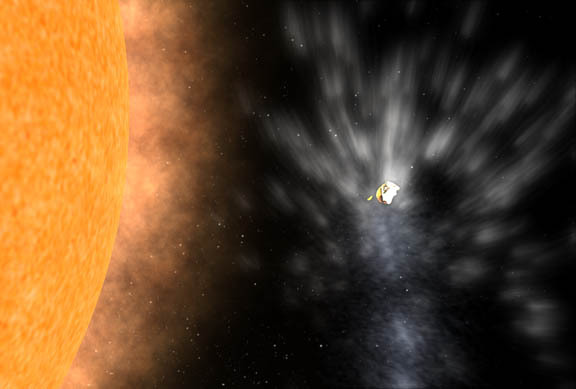 This image is from a computer artist’s animation of the breakup of a single comet near the Sun. The fragmenting comet is the white object on the right. Is this ISON’s fate? Astronomer Ignacio Ferrin, FACom researcher, has determined the fate of comet C/2012 S1 ISON, described by some as “the comet of the century.” The comet has fizzled completely. Dr. Ignacio Ferrin, astronomer from the Institute of Physics of the University of Antioquia in Medellin, Colombia, has concluded a study of the comet using the latest observations available. Dr. Ferrin is a researcher and faculty member in the astronomy program of that institute. He is a recognized cometary specialist. “Comet ISON has presented a peculiar behavior,” said Dr. Ferrin. “The light curve has exhibited a ‘slowdown event’ characterized by a constant brightness with no indication of a brightness increase tendency. This slowdown took place around January 13, 2013. For 132 days after that date and up to the last available observation, the brightness has remained constant.” Thus the astronomer concludes that it is highly unlikely that the comet will be as bright as the full Moon. This peculiar behavior could possibly be explained if the comet were water deficient, or if a surface layer of rock or non-volatile silicate dust were quenching the sublimation to space. The strange behavior of comet ISON is reminiscent of what happened to comet C/2002 O4 Hönig who remained with the same brightness for 52 days, after which it disintegrated with no observable residue. It is to be noticed that comet ISON has been in that state for much longer, 132 days and counting. However astronomers do not know what is the current status of the comet, since it has entered the solar glare and it is unobservable. These images from NASA’s Spitzer Space Telescope of Comet ISON were taken on June 13, 2013, when ISON was 312 million miles (502 million kilometers) from the sun. The lefthand image shows a tail of fine rocky dust issuing from the comet, blown back by the pressure of sunlight. The image at right shows a neutral gas atmosphere surrounding ISON, likely created by carbon dioxide fizzing off the comet at a rate of 2.2 million pounds per day. Even if the comet survives this scenario it will have to surpass other difficulties. The comet will reach perihelion very near the Sun, where the astronomers have calculated a temperature of 2,700 degrees Celsius, sufficient to melt iron and lead. Besides this trial by fire, the comet will penetrate Roche’s limit. Any object that penetrates this forbidden limit will experience solar gravitational forces that may tear apart the nucleus of the comet. The combination of temperature, radiation and tidal forces below the Roche’s limit may prove too much for the comet, which may not survive the encounter with the Sun. There is a brief window of observation between October 7th and November 4th when the comet will be more than 50 degrees from the Sun. The scientist adds that even so the observational conditions will be difficult to determine what was the fate of the comet. “The future of comet ISON does not look bright,” Dr. Ferrin concludes. Sourcxe: University Of Antioquia In Medellin, Colombia. Earlier report: Observations on June 13 by NASA’s infrared Spitzer Space Telescope reveal that dust and carbon dioxide gas are streaming off Comet ISON, forming a tail about 186,400 miles (300,000 kilometers) long, researchers said. “We estimate ISON is emitting about 2.2 million pounds (1 million kilograms) of what is most likely carbon dioxide gas and about 120 million pounds (54.4 million kg) of dust every day,” Carey Lisse, leader of NASA’s Comet ISON Observation Campaign and a senior research scientist at the Johns Hopkins University Applied Physics Laboratory in Laurel, Md., said in a statement. But there’s no guarantee that ISON will live up to the hype. For example, it could break apart as it approaches the sun, fizzling out as some other “comet of the century” candidates have done over the years. While it’s tough to predict the behavior of any comet, forecasting ISON’s sky show is particularly difficult. Scientists think ISON is making its first-ever trip to the inner solar system from the distant and frigid Oort Cloud, a huge repository of comets that lies between roughly 600 billion and 6 trillion miles (965 billion and 9.65 trillion km) from the sun. Comet ISON on the morning of December 10, 2013. The view is toward the east before dawn. Chart via Dave Eagle at www.eagleseye.me.uk.